This 4 person tent is as convenient as it is stylish. The intuitive dome design is complimented by a sewn in groundsheet, lightweight fibreglass poles, high visibility guy ropes, and tent pegs. 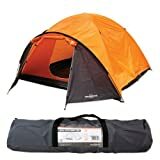 Ideal for camping and festivals, this tent is a great find!